Published June 1, 2006, by the University of Chicago Press. Visit the University of Chicago Press's online catalogue. A paperback edition was released in Spring 2008. The book is available at Amherst Books, 8 Main St., Amherst, Mass., tel. (413) 256-1547. If you are not in the area, you can buy the book online from Amazon.com, BarnesandNoble.com, and many other sellers. At this writing (March 29, 2008), Amazon.com is offering a 28% discount off the list price ($27). 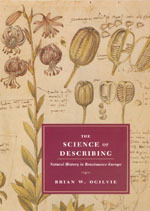 2/6/07: The Science of Describing received the honorable mention (2nd place) in the History of Science category in the Association of American Publishers’ 2006 Professional and Scholarly Publishing Division Awards for Excellence. For more information, see the AAP's press release.